Mexican food is diverse as the people and their culture. The Bald Chef (Glen Izett) has spent many nights eating in some of the great restaurants in Guadalajara, Mexico City, Cancun, Mazatlan, Nuevo Laredo, Heroica , Nogales, Manzanillo , Tijuana, and Puerto Vallarta Mexico. Mexican food is a great love of mine. Mexican food can vary from all regions of Mexico. Most people think of Mexican food such as tacos, enchiladas, fajitas, and quesadillas but there is much more to Mexican food than these dishes. In Mexico I have eaten some of the best fish dishes I have ever had anywhere. And any one that’s been in Mexico knows that the Guacamole and tortilla chips will never stand up to what we have here in the USA. The food from Mexico is top of the line cuisine. 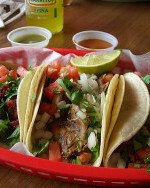 The real food from Mexico includes Tacos which include tacos de Asada, Tacos de Pescado (fish tacos), tacos al Pastor, and my favorite tacos carne asada. Also Mexican food includes Camarones Rancheros, chili rellenos, Mexican mole sauce with chicken, and Mexican taquitos. What are the most important ingredients in Mexican cuisine? My first answer would be tortillas. Tortillas can be made of wheat or corn; they are the bread of Mexico. Tortillas are most often made from corn and are served in most Mexican meals. The next most important ingredients in Mexican food is chilies such as Pasilla, Poblano, and Ancho chilis. And the third most important ingredient in Mexican food would be beans or rice. Flautas are a miniature taco and a great finger food that are seen in many parts of Mexico. We have some great Mexican recipes on this web site I think you will love to eat.